September 14, 2013 dawned as a “refreshing” day with a crisp breeze and overcast sky – in most of the Rochester region. 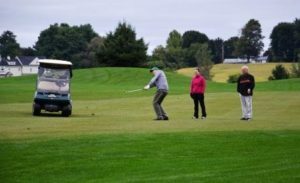 However, the atmosphere at the Southern Meadows Golf Club was brightened by 32 individuals who chose to play in CFFC’s inaugural golf tournament. These folks also brightened the future for CFFC and the CF community by generating $2,000 to fund a CF education day in 2014. 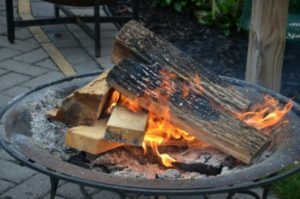 After checking in at the registration table, some players chose to warm up by hitting a few balls on the practice range while others took a more traditional route; that is, huddling around the welcoming camp fire provided by the staff. Click on the pictures for a larger version. 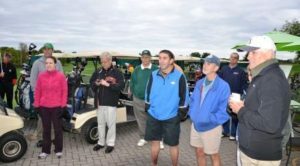 After a few opening remarks, the players, forming eight teams, headed out for a shotgun start. 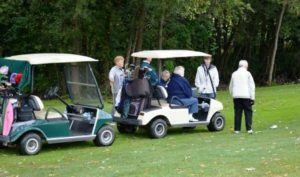 While the cause was special, the golf was like any other day – drive, iron to the green and putt (and maybe a few other special shots…). 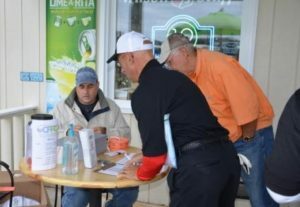 It was a tough day to work up a thirst, so our volunteers handling the beverage station dispensed mostly warm greetings and best wishes for a hole in one. 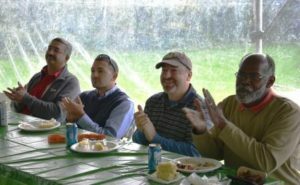 Despite the recurring comments about the temperature, the smiles were evidence that everyone enjoyed the golf and the company of other friends of CFFC. When play was completed, it was time for lunch – billed as an Indian Summer Picnic. 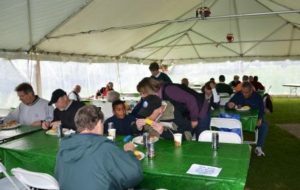 Everyone was eager to work down the buffet line and get into the tent (out of the breeze) to enjoy the meal. 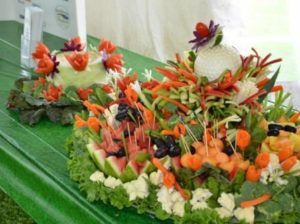 Once inside, they found a lovely fruit and veggie display provided by one of our sponsors (Plantation Party House). If anyone didn’t get enough to eat, it was their own fault. 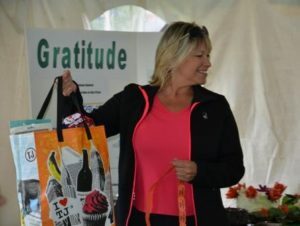 And what’s a golf tournament without prizes? 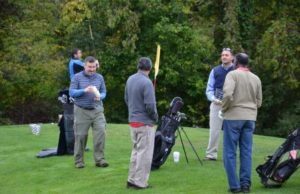 The tournament offered two ways to win: shooting a low score or holding a lucky raffle ticket. We even had some t-shits that only required the “winner” to show up. 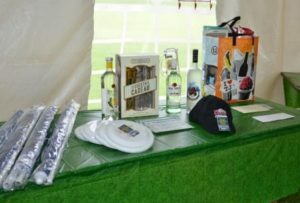 Prizes were awarded to the five teams with the lowest scores. Here are the winning teams. Tom Skavienski, Laura Skienski, Jon Pecor and Kevin Wetmore with a score of 29 (three under par). 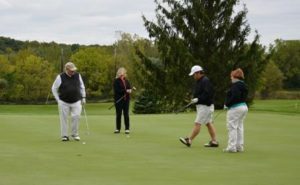 Allan Mason, Kelly Berchiatti, Sue Smith and Greg Smith with a score of 31 (with a tie breaker). Tim Brady, Doug Booth and Dan Davis with a score of 31. Aaron Daniels, Dan Leitten and Brian Luke with a score of 32. Jean Rogers, Betty Wynne, Pat Willis and Louise Miller with a score of 33. We also had three raffle winners. Bruce Collins was flying high with the balloon ride from Liberty Balloon Co. Kelly Berchiatti traded in her winning ticket for the gift pack from Trader Joe’s. Rich Mapes produced the winning ticket for the gift certificate from GroMoore Farms. 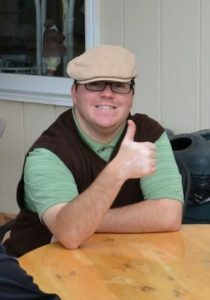 How about a big round of applause for the people who helped make the tournament a success. 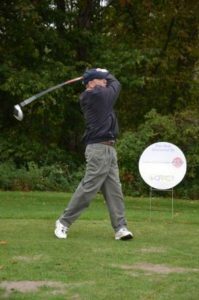 The staff at Southern Meadows not only provided a perfect venue for our tournament, but also offered some great advice to get us started: Mike Clawson is the club pro; Rick Clawson and Dan Park do the bulk of the grounds work. 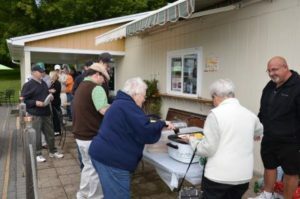 We had a small but dedicated band of volunteers: Paul Infantino (registration and set up); Donna and Tony Scribani (beverage station and set up); Lisa Brady, Shayna Brady, Nick Brady and Rick Doherty (lunch set up); Kori Tolbert (awards program); and Greg Smith (tournament chair). Donna, Lisa, Rick, Kori and Greg are all officers for CFFC. Of course, a big part of a fund raising event is the support we get from our business sponsors. 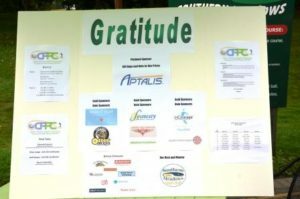 It was particularly gratifying that five of our sponsors deliver products and services directly associated with CF care. Check our 2013 sponsors page for a complete list of this year’s contributors.